Darren Wilson testimony: Michael Brown shooting as narrated by officer. 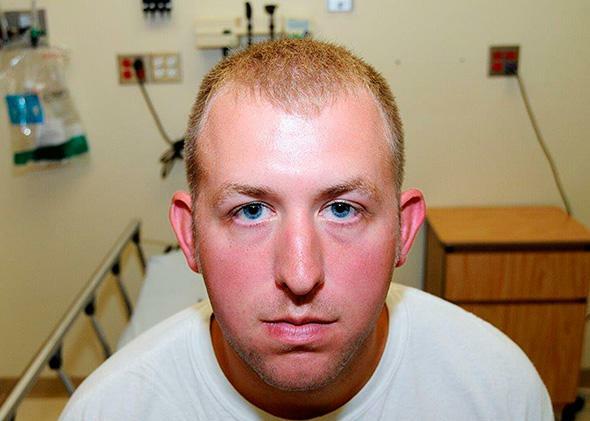 Photo of Ferguson, Missouri, police officer Darren Wilson taken shortly after the Aug. 9, 2014 shooting of Michael Brown. After announcing that a grand jury had declined to indict officer Darren Wilson for the shooting of Michael Brown, St. Louis County Prosecuting Attorney Robert McCulloch took the unusual step of publicly releasing the evidence that jurors reviewed. The transcripts include Wilson’s own lengthy testimony about the fatal incident, key points of which are excerpted below. Throughout, Wilson dwells on how he was frightened by Brown’s size—the 18-year-old was 6-foot-4 and nearly 300 pounds—and aggression. At one point, Wilson says that Brown’s facial expression made him look “like a demon.” At another, he explains that he felt like “a 5-year-old holding onto Hulk Hogan” as he struggled with Brown through the window of his police vehicle. Wilson himself is also about 6-foot-4. Wilson begins by describing how he first spotted Brown and his friend, Dorian Johnson. Wilson told the pair that they should move to the sidewalk. He and Brown exchanged words, and at that point, Wilson says he noticed that Brown was carrying a box of cigarillos. Officers were searching for a robbery suspect who had just stolen such a box from a convenience store, so he decided to confront Brown. Wilson says Brown handed Johnson the cigarillo package, then continued assailing him. Wilson explains that he couldn’t protect himself while reaching for his mace or a blunt object like his flashlight, so instead he reached for his gun. Upon further questioning, Wilson says he was afraid Brown was about to punch him to death. After Wilson pulled out his weapon, he says Brown grabbed it, and the two began struggling. Once Wilson managed to move the gun barrel away from his leg, he says he started pulling the trigger. At first, nothing happened. As Wilson describes it, the first shot only made Brown angrier. After more scuffling, Wilson says he fired another shot in the car. Brown took off running and Wilson left his vehicle to chase after him. They passed two cars, then stopped. Finally, Wilson says, he shot Brown in the head when he was 8 to 10 feet away.